Note: A version of this article has been published in The Conversation. A place where teeth will find no food to chew! Somalia is mostly dry and semi-arid with the exception of few areas of greenery in the northern mountains or the riverine agricultural fields in the south. Since the acceleration of violence in the late 1980s that propelled it into civil war, two things have been occurring in Somalia on a more or less regular basis: conflicts and famines, and both have been linked, in one way or the other, to climate change. There have been at least seven major food insecurity incidents in Somalia since the beginning of the civil war: 1991–92 (famine), 1999–2000 (food crisis), 2006 (food crisis), 2008 (food crisis), 2011–12 (famine), 2014 (food crisis), 2016–17 (food crisis verging on famine). There has been a growing narrative that climate change causes violent conflict and even war. This narrative is attractive because it puts the onus on major greenhouse gas contributing nations to curb their emissions or risk wars in countries that contributed the least to greenhouse gas emissions. Although there is some truth to the climate-conflict narrative in certain specific circumstances, it has been presented in such an overarching manner that is exaggerated , oversimplified, and defies nuance. In this post, I will focus on the country of my birth, Somalia, and the links between the conflict, famine, and climate. Did climate cause the conflict in Somalia? No. Climate did not cause the conflict in Somalia. The Somali conflict has deep political roots that go back to the country’s failed invasion of Ethiopia in 1977 (and possibly further back to the unification of Italian Somaliland and British Somaliland). In 1978, subsequent to the Somali-Ethiopian war, between 650,000 and 1.4 million ethnic Somali refugees from Ethiopia’s Somali region fled persecution by the Ethiopian military into Somalia. The following years saw the Somali government becoming cash-strapped (wars are very expensive). In 1981, the imposition of International Monetary Fund prescriptions, which included liberalization, currency devaluation and spending cuts worsened an already dire situation. Subsequently, the decade after the end of the Somali-Ethiopian war was marked with severe austerity and several cost saving measures. Despite the austerity, the Somali government continued to arm and fund guerrilla activities in Ethiopia’s Somali region using refugees from that region who fled into Somalia. The high cost of food, public sector layoffs, and rising unemployment led to widespread protests against austerity, which were met with brutal repression. This allowed the resentment to fester and eventually reach its apex during the late 1980s and early 1990s. Gauging the civil unrest that was brewing in its neighbor, Ethiopia began arming and funding clan-based opposition movements that sought to overthrow the government. The Barre government, which had been in power since October 1969, and that had essentially built the Somali state, eventually collapsed in January 1991, ushering in the Somali Civil War. Is there any link between climate and conflict in Somalia? The link between climate and conflict in Somalia (and indeed elsewhere) is much more nuanced than the oversimplified cause-and-effect scenarios encountered through sensationalist news headlines. In this section, I will attempt to elucidate a few of these nuances. Like other tropical semi-arid areas, the seasons (and livelihoods) in Somalia revolve around rainfall. The main rainy season (gu) from April to June is followed by a dry season (xagaa) from July to September, which is in turn followed by another rainy season (deyr) from October to November, and the main dry season (jilaal) from December to March completes the seasonal cycle. In parts of northwestern Somalia, the xagaa dry season is replaced by the karan rainy season. The harvest period depends on the type of crop, but there are generally two main harvest seasons in Somalia. For the gu, farmers plant their crops in early April and harvest them around July/August, and for the deyr, farmers plant their crops in early October and harvest them in January/February. Prices of crops follow a seasonal trend: they decrease in July/August as the gu harvest replenishes stocks, increase between September and December as market stocks are used up, and decrease again in January/February with the deyr harvest. The rains bring relief to everyone in Somalia, but they are particularly crucial to the people whose livelihoods depend on the land. In the pastoral zones, a good rainy season means that lush vegetation covering important grazing areas and ample water resulting in nourishment for livestock, their main source of livelihood. In the agricultural and agropastoral zones, a good harvest season brings with it (1) replenishment of household stocks of different crops, (2) increased employment opportunities as demand for agricultural labor increases, and (3) decrease in the prices of crops as market stocks are replenished. To illustrate how unmitigated droughts can upend livelihoods in Somalia, let’s take the most recent food insecurity to hit the country. In 2016, the area under cultivation for the gu rains (April — June) was low because of erratic rainfall, which led to a low harvest in July/August. Later that year, the deyr rains (October — November) were severely below average leading to low river water levels and reduced harvest by up to 70 percent. In the northern pastoral and agropastoral parts of Somalia (in Somaliland and Puntland) the situation is exasperated by the fact that the 2016 jilaal dry season (December 2015 — March 2016) was hotter and drier than usual, and the region was affected by drought for two consecutive years prior. This decimated the livestock assets and caused a failure of the harvest in the agropastoral zone leading to the communities in those regions exhausting their food stocks already in November instead of March. In southern Somalia, the 2017 jilaal dry season (December 2016 — March 2017) was also hotter and drier than usual with extremely low availability of pasture and water resources. The 2017 gu rains (April — June) started late, were shorter than normal, and around 20–50% below average in the central and southern parts of the country. This will probably cause a lower than average harvest in July/August 2017. The combined effects of these events intensify food insecurity, worsen livelihoods, and, as desperation settles in, people become increasingly dependent on aid. U.S. Department of State’s Humanitarian Information Unit drought and displacement map for Somalia as of May 2017. 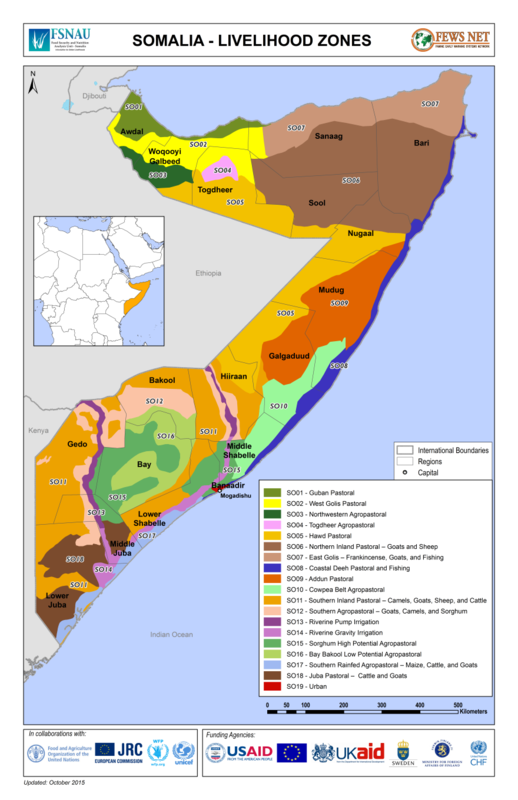 In southern Somalia, the militant group al-Shabab, formed in December 2006 as an offshoot of the Islamic Courts Union, controls large swaths of territory that encompass key agricultural areas. The group relies on a variety of tactics to get new recruits and solidify their presence in the territories they control. For example, in one area they build canals to facilitate irrigation for local farmers. At the peak of the 2011/12 drought, al-Shabab was reported to have sabotaged the relief effort by restricting access to humanitarian agencies. This further exasperated the situation of the people affected by the drought. The anecdotal evidence above suggests that al-Shabab’s recruitment methods involve using drought as a means of gaining trust and protection of local communities. During the 2016/17 drought, al-Shabab began to distribute food in the areas it controls as a means of dealing with the bad publicity it garnered during the 2011/12 drought. However, the food they distribute has to come from somewhere and there is evidence that the group is still blocking food aid, and possibly redistributing it under the guise of unconditional humanitarianism. In this particularly extreme scenario, i.e. nonexistent central institutions, an ongoing insurgency and severe drought, the “climate-causes-conflict” narrative still does not apply because the conflict was still ongoing when the drought occurred. However, climate does exacerbate the conflict by giving the insurgency leverage and infusing it with more manpower. This is the “threat multiplication” effect of climate change that the Pentagon recently referred to. If there is a strong central government with the capability to act quickly, alleviate the situation and minimize loss of life (as during the 1973–75 drought, see section below) the impact of the natural disaster can be effectively mitigated and the insurgency’s leverage nullified. An Al Jazeera graphic showing a timeline of al-Shabab attacks since the formation of the group in 2006. The increased frequency of attacks between 2010 and 2013 and from mid-2016 until mid-2017 roughly corresponds to periods of droughts. The Dabadheer or “Long-tailed Drought” lasted from April 1973 through June 1975, is believed to have been a continuation of a severe drought that devastated vast areas of North Africa, and is generally considered the worst in living memory by the populations affected. Traditional ways of coping with a harsh way of life were not adequate to prevent widespread famine. As a result, there was a mass exodus of nomads from the rural areas to towns in search of food. During the drought’s most desperate period in March 1975, refugees flowed into some 20 relief camps, as many as 5000 a day. By the arrival of the mid-year seasonal rains the total population of these camps was estimated at nearly 300,000. The drought affected nearly 700,000 nomads in half of the country’s 16 regions. More than 20,000, mostly children and the elderly, were estimated to have died. Further, the drought claimed more than 5 million animals, nearly half of Somalia’s sheep and goats and a third of its cattle, and up to 120,000 tons of food grains. Emergency relief aid came from the Somali government which spent about US$40 million [equivalent to US$ 209 million in 2017], while international sources provided food relief valued at US$43 million [equivalent to US$ 225 million in 2017], monetary donations totaling US$39 million [equivalent to US$ 204 million in 2017], and medical supplies and other material relief items. With the rains, most of the drought refugees returned to the rural areas to rebuild their herds. Those who remained behind, some 120,000, continued to be assisted by teams of doctors, veterinarians, army engineers, and student volunteers. (Tsui et. al. 1991). The excerpts above detail conditions during the severe 1973–75 drought. Somalia at the time had a strong central government and institutions that exhibited good governance by effectively dealing with the natural disaster and reducing its impact. Additionally, international help was sought quickly and the loss of life was minimized. Around US$ 640 million (2017 equivalent) were spent on drought relief efforts. The Government of the Somali Democratic Republic promptly and effectively mobilized all resources at its disposal to cope with the emergency. It soon became apparent, however, that external relief assistance was urgently needed-chiefly in the form of basic foodstuffs, medicines, and other necessities of life. The international community was quick to respond to Somalia’s needs. Compare this to the impact of the same drought on neighboring Ethiopia, where between 50,000 and 90,000 died of famine (some sources reported up to 200,000 deaths). This catastrophe unfolded due to a combination of factors including a decline in purchasing power of peasants in the famine-affected region, a poor transportation network, a 7% decline in crop production, and deliberate government cover-up as reports of a pending famine were consistently ignored or denied by corrupt officials. Additionally, the Ethiopian government was fighting resistance movements in Eritrea, Oromia and the Ogaden that later turned into full insurgencies. There are also unsubstantiated reports that the government reportedly spent a considerable amount of money on Emperor Haile Selassie’s 80th birthday as the famine was unfolding (though, I was unable to find evidence of exactly how much). By September 1974, the imperial government was overthrown. No one knows for certain. But, if the past is an indication of what will happen in the future, there is strong chance of increased drying in Somalia going forward. The record spanning the past two millennia indicates a persistent association between globally warm conditions and drying in the eastern Horn region, suggesting that present and future warming will be met with drying. This means that based on records from the past 2,000 years there’s always been a strong link between global warming and increased dryness in the Horn of Africa. And it is this future that the Somali government, its people and civil society should prepare for using the combination of indigenous knowledge and homegrown technology.